The Celtic Rathskallions offer programmes specially adapted for schools, family festival and theatre venues, as well as unique orchestra collaborations. Click on a programme title to view more information. It’s time to visit the present! House Concerts are parties and social gatherings for friends celebrating and enjoying music. In January of 2017, we released a new Moore & McGregor recording, produced by Paul Mills . With this new recording, we have been performing more and more in clubs, house concerts and festivals. Visit us at Moore&McGregor. We have increased our gigging considerably. 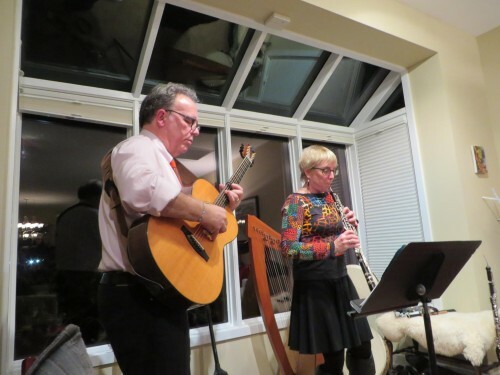 In 2015 we toured Ireland again with 23 shows, toured Florida with 17 shows, did an tour of eastern Canada with 10 shows, a tour of western Canada with 18 shows and a flock of shows in the Ottawa/Southern Ontario area. In 2016 we again visited Ireland, and did two Maritime tours along with tours in the Ottawa/Toronto area. So far, in 2017 we have toured SW Ontario, Western Canada, Northern Ontario and the Maritimes. Since October of 2016, we have performed over 150 shows! AND we’re doing more House Concerts. We love performing at House Concerts. It’s an intimate venue that’s great for our wide diversity of instruments and tunes. Folks love our shows. If you’d like to discuss house concerts and how they would work for you, drop us a line. When The Celtic Rathskallions take their show to an elementary school, it always consists of Wendy Moore and ONE other member of the troupe (see individual bios on the performers page). Their lively and entertaining hour long performance features music (they play 15 instruments between any two of them) and also includes stepdancing and storytelling. They incorporate many instructional elements from the Ontario Music Curriculum. Audience members also volunteer to assist on stage and there is a question period included at the end of their show. Students are encouraged to participate in: action songs, clapping tunes, instrument demonstrations and rudimentary stepdance. Watch a video of them in action! Wendy Moore is the author of a 75-page Music Curriculum Resource Guide for grades 1-8 which accompanies school performances. Master copies of student activity sheets are also included for each grade level. These resources provide useful, curriculum-based follow-up materials for the classroom. Also included in the resource package is the The Celtic Rathskallions CD, All Around the Circle and a Maddie’s Moon illustrated storybook. This story is presented live at each show as a narrated, dramatized tale, set to music. 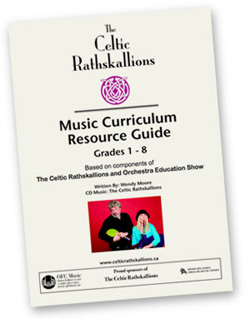 The Celtic Rathskallions show appeals to a wide age range of students from kindergarten through grade 8. Their performances and workshops are highly acclaimed throughout 65 Ontario school boards, at conferences, festivals and special events. For a list of schools and venues where the Celtic Rathskallions have performed, visit the performance history page. Please contact us for a complete list of schools we’ve worked with. See the fees page for pricing and booking info or contact Wendy Moore for details by phone at (613) 258-6200 or via email at wendy@celticrathskallions.ca. The Celtic Rathskallions perform in soft-seat theatres and at festivals for families and children. Engaging and delightful, their shows are entertaining as well as informative.Two or more Rathskallions will entertain you with familiar favourites such as I’s the B’y, The Unicorn Song, The Rattlin’ Bog and many more. Before you know it you will be clapping, singing and even stepdancing along with them. Between any two of them, the Rathskallions play 15 different instruments. Their shows include Celtic (and folk and classical) music, drama, stepdancing and storytelling set to music. Performances range in length from 45-90 minutes depending on the venue and type and age range of the audience. See their performance schedule for shows nearest you. To book the group, please phone (613) 258-6200 or email Wendy Moore. Orchestra shows are available as both education and family show programming. These engaging and delightful performances are designed to feature the different sections of the orchestra as well as to exemplify a unique blending of the classical and folk (Celtic) worlds of music. Shows are entertaining as well as informative. As well as featuring classical and folk music, programming for both education and family shows also includes stepdancing, drama and storytelling set to music. Programming for the shows includes a variety of original orchestrations arrangements for Celtic Rathskallions and “home orchestra”, as well as traditional orchestral works for orchestra alone. Original arrangements for these shows have been created by three of Canada’s prominent orchestral arrangers – Scott Macmillan, Claude Lapalme and Tom Leighton (see bios below). Arrangements are suitable for orchestras ranging in size from small (26-piece) to full-size. Performances range vary in length from 45-90 minutes depending on venue, repertoire and performance time mandates, as well as the type and age-range of the audience. Full resource packages and workshop handouts are provided for schools attending the education performances. The Celtic Rathskallions and Orchestra programme premiered with the Kitchener Waterloo Symphony in November 2007. A morning stepdance workshop was included for teachers, students, and the community. Elementary school students join the orchestra for a participatory concert hall experience. A family-oriented orchestral concert experience. See the fees page for pricing and booking info or contact Wendy Moore for details by phone at (613) 258-6200 or via email at wendy@celticrathskallions.ca. For a reference, please contact KWS conductor Dan Warren (519) 822-1109, dpwarren@sentex.net.